Tue., July 13, 2010, 4:42 p.m.
BOISE - Idaho Gov. 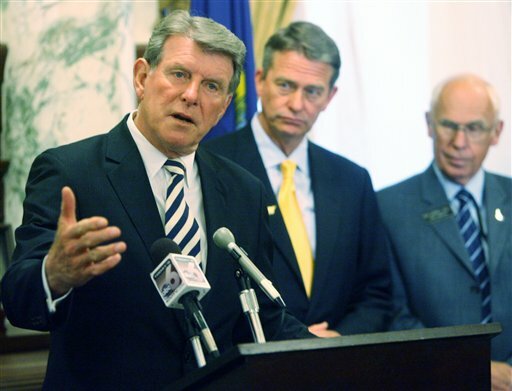 Butch Otter closed the books on a tough budget year for the state Tuesday, saying the final numbers - an $8.26 million year-end shortfall, which was easily covered - justify his and lawmakers’ decisions to make deep mid-year cuts in the state budget this year. Otter’s Democratic challenger, Keith Allred, contended Otter was “missing the point,” and said he backed the cuts for the past year, but not deep cuts to education that Otter and lawmakers approved for next year. “The governor was wrong to build next year’s budget based on the assumption that it will be as bad economically as this year,” Allred said. Idaho made up its year-end shortfall by transferring $8.26 million from its permanent building fund, money that otherwise would have gone to building maintenance projects. June state tax revenues fell $6.9 million short of projections, after May revenues came in $4 million above projections, but there were bigger shortfalls earlier in the year. Overall, revenue for the fiscal year that ended June 30 was $86.5 million below the state’s official forecast, at 2.26 billion - lower even than the $2.28 billion figure lawmakers adopted. Otter acknowledged that the budget was balanced in part through pushing off some Health and Welfare payments into the next fiscal year. He compared that move to a family paying the minimum payment on a credit card balance in tough times. He also noted that state agencies suffered deep cuts and many state workers took unpaid furloughs. He noted that public schools were protected from most cuts in the past year, but in the next fiscal year, Idaho’s public school budget is facing an unprecedented $128 million budget cut. However, that $128 million budget cut can’t be stopped now without legislative action; lawmakers don’t convene their session until January of 2011, halfway through the next school year. After this year’s budget struggles, Idaho’s only remaining budget reserve funds now are $17.5 million in the public education stabilization fund, and $71 million in the tobacco-settlement Millenium Fund, which lawmakers and the governor chose to keep as a reserve in case a federal funding boost for Medicaid doesn’t come through. Published: July 13, 2010, 4:42 p.m.